How do you fabricate solar panels at half the cost and 1/10th the thickness of conventional panels? With a custom-built particle accelerator ten times more powerful than conventional accelerators of course. As we reported yesterday, Twin Creeks Technologies is doing some pretty wild things with solar cells. They're only 20 microns thick and extremely flexible compared to the brittle 200-micron-thickness for traditional panels. Even more amazing is how the svelte panels are made. Traditional solar wafers are produced by slicing a 200-micrometer-thick slab from a slab of crystalline silicon, embedded with electrodes and mounted under protective glass. This method wastes nearly half the silicon in the cutting process (think: silicon sawdust) and results in a brittle wafer. Twin Creeks Technologies, located in Senatobia, Mississippi, uses a method known as Proton Induced Exfoliation (PIE) and gigantic Ion Cannon known as Hyperion, to bypass both these problems. 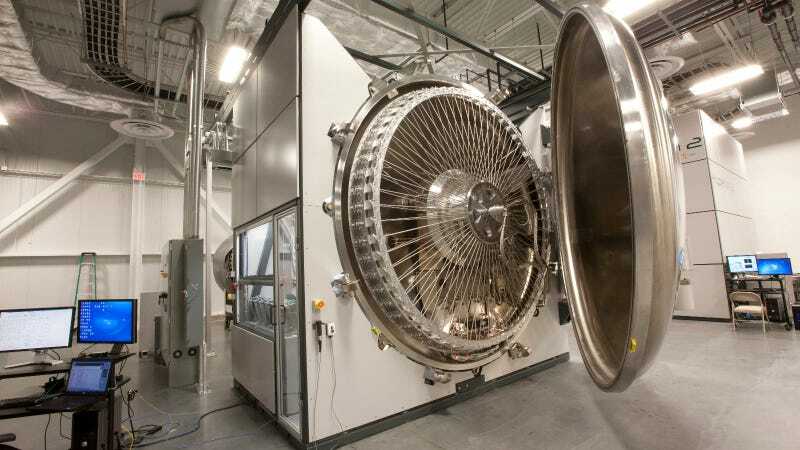 First, three-millimeter-thick silicon wafers are placed around the outside edge of the machine's central wheel and will act as the source material for the wafers being produced. Hyperion then charges up its particle accelerator and embeds a layer of protons (basically hydrogen ions) 20 microns below the template's surface. Robotic arms then transport the templates to a furnace which heats them and expands the ions back into hydrogen gas. This causes a thin layer of wafer to cleanly shear from the template but otherwise remain identical to the source material. According to the Twin Creeks site, "The physical attributes of hydrogen, combined with the conditions created by Hyperion, permit the ions to penetrate the surface of the donor wafer without changing its inherent properties and characteristics." Essentially, the company is using the hydrogen ions as a molecular scalpel. After shearing, the thin wafer receives a metal backing to prevent cracking and improve the wafer's flexibility and can also be further processed into either solar cells or semiconductors. The template is returned to the Hyperion for another round of proton infusions. "The thickness of wafers today is based on wafer slicing capabilities and the handling requirements for device processing. In reality, only the very top layer of a substrate plays an active role in generating energy or transmitting signals — the rest is wasted," said Dr. Siva Sivaram, CEO of Twin Creeks. "By eliminating excess material, we will help solar manufacturers produce modules that compete with grid power and open up new markets for chip makers." Sivaram says that this method reduces the amount of silicon needed by a whopping 90 percent and that by eliminating the need for wire band saws and the like, capital costs are also greatly reduced. Sivaram estimates that the Twin Creeks method can produce solar cells for about 40 cents per watt—half that of even the most cheaply produced cells coming out of China. At 40 cents a watt, solar could quickly become as profitable as conventional fossil fuels. A single Hyperion can process over 1.5 million thin wafers per year, enough for more than 6 megawatts worth of solar cells. But Twin Creeks isn't in the solar panel business, it's in the proton accelerator business. The company hopes to integrate the Hyperion into the existing production lines of solar panel manufacturers. "I expect that by this time next year, we'll have a half a dozen to a dozen of these tools in the field," Sivaram said.